You are currently browsing the archives for the “films” tag. This summer, Nightmare Cinema will have its long anticipated premiere at the Fantasia Film Festival in Montreal. A Lifetime Achievement Award For Joe Dante! 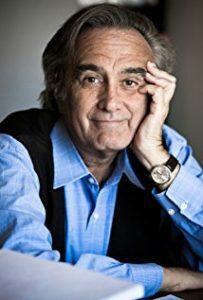 Fantasia will be presenting a Lifetime Achievement Award to adored US genre legend Joe Dante, a man whose inspired filmography has touched generations of cinephiles. From PIRANHA, THE HOWLING, and the universally-beloved GREMLINS films to INNERSPACE, EXPLORERS, and his bold television work, Dante’s works are electric with witty personality and brim with innovative storytelling and a big-hearted affection for all things film. As Fantasia will be World Premiering his latest work with NIGHTMARE CINEMA, there couldn’t be a better time to honour the great man. Previous recipients of Fantasia’s Lifetime Achievement Award include Guillermo del Toro, Takashi Miike, Ken Russell, Tobe Hooper, Jean Rollin, Andrzej Zulawski, Mamoru Oshii, John Landis, José Mojica Marins, Larry Cohen, and Ray Harryhausen. More updates coming soon. Until then … scop on! Sarah Elizabeth Withers in Nightmare Cinema’s “Thing in the Woods,” written and directed by Alejandro Brugués. Photo by Michael Moriatis, The Hollywood Reporter. It’s the journey, not the destination. Emerson said something like that once. He might have been talking about screenwriting. The path that “Traumatic Descent” (a.k.a. 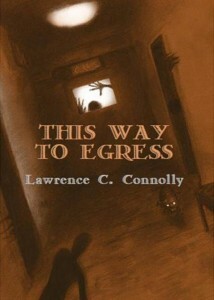 “This Way to Egress”) has taken on its way to the screen is the subject of a newspaper article in a recent issue of the Pittsburgh Tribune-Review. On the whole, the paper provides a good summary of the details, although it does suggest that “TD” was under option for a quarter century. That’s not exactly true, even if it has sometimes seemed that way. The story first appeared in the hardbound, limited-edition of Borderlands 3 in the early 90s, but it wasn’t until 2000 that a young filmmaker found it reprinted in a mass-market paperback in London. That was the beginning of the journey–a seventeen-year trek through the at-times fascinating circles of development hell. And now it appears the trek is finally leading somewhere. Earlier this fall, David Slade and I submitted our revised script for “This Way to Egress” to Mick Garris, who has partnered with Good Deed Entertainment to produce the story as part of a feature film titled Nightmare Cinema. A flurry of announcements followed our completion of the script, culminating (for the moment) with the article in the Trib. You’ll find links to some of those earlier announcements at the blog post “Horror Films are Good for You,” while the full text of the newspaper article is available at the Trib‘s website. Interestingly, the Trib also published a strong review of “Traumatic Descent” when Borderlands 3 first came out 23 years ago. The reviewer called the story “one of the finest scare stories ever written.” Not bad. The photo to the left appeared with that article. Fast forward, and we have the photo to the right, which ran with last week’s story. 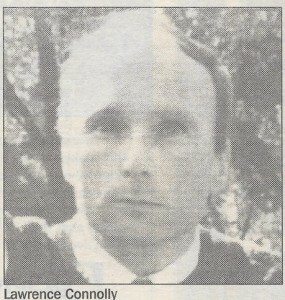 I trust the comparison suggests that the ensuing years have treated me fairly. At any rate, it looks as if I’ve been keeping busy. I’ll post updates about the film as they come available. 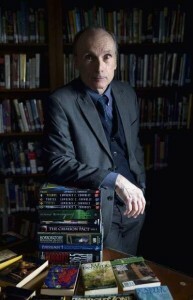 In the meantime, mark your calendars for April 21, when I’ll be speaking at The Penguin Bookshop in Sewickley. The title of that talk? “From Page to Screen: A Story’s Journey.” No doubt I’ll have plenty to report. Until then . . . scop on! This Way to Egress, cover © 2010 by Jason Zerrillo. 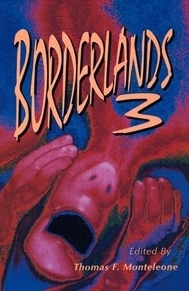 Borderlands 3, cover © 1993 by Rick Lieder. The 21st-Century Scop. Kristina Serafini, Tribune Review. Powered by WordPress and delivered in 0.305 seconds using 41 queries.